Mom Taxi Julie: 3 Day Weekend! I'm so glad it's a 3 day weekend. I forgot all about it until a couple days ago. So far I only have plans for Saturday. We are having a "Hippie Party". The party was originally going to be outside but it's supposed to be 110 or some death heat so it's been moved inside. Which means it will probably be over pretty quickly after the food comes out at 2. Inside parties never seem to last very long. So here is my latest little project. 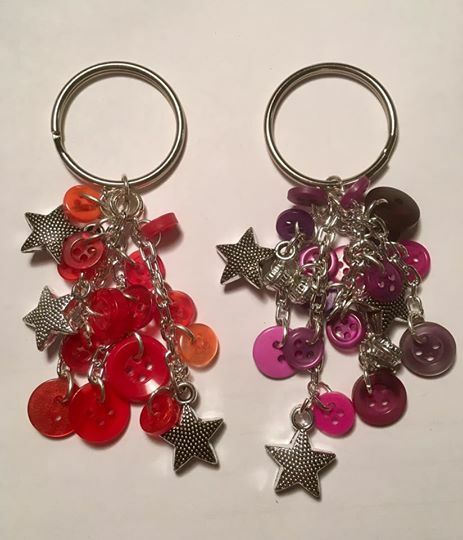 Button key chains. 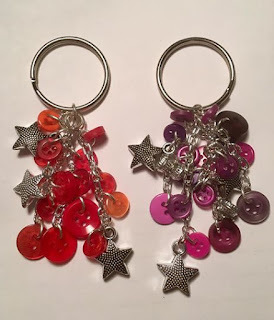 I was looking on Pintrest the other day for ideas using key rings. I have a bunch since they came with the little clips I bought for key fobs. I found this cute idea so thought I'd give it a whirl. I'm hoping they aren't too delicate and fall apart when I use them. I need to put a trial one on my key chain. I have never really made any jewelry type things before so using the little rings was interesting. That barely made dent in the little buttons I have too. I was thinking I can make some little cards to put them on for my next craft show. Awww those key chains are so cute!